Today, when urbanites here talk about SoHo, chances are they’re not referring to the trendy Lower Manhattan neighbourhood in New York City. Instead, SoHo stands for small office/home office, a concept growing in popularity as a small but significant segment of the workforce increasingly champions working from home. Once thought to be the antithesis to relaxation, bringing work home has become the new, not entirely lamentable, norm. Omnipresent connectivity means we naturally take our office and workload wherever we go. Push emails flood the inboxes of our smartphones and charts are reworked on laptops at the dinner table — switching off is hard to do for a corporate figure or entrepreneur with a to-do list that never quite gets done. As the Zen masters might suggest, perhaps the key is to not struggle against the tide but to embrace the positives, and there are many. Setting up a dedicated home office delineates the stress zone, so to speak, clearly demarcating spaces for work and play. Outfitting the workspace to your taste allows you to emphasise your priorities — big windows for sunshine and a view or colourful walls and ample storage, for example. Perhaps you are reluctant to compromise on fitness and well-being despite the number of hours you spend in front of the computer — swap a roller chair for an exercise ball. Tweak and take all the creative liberties you desire to create a sanctuary conducive to productivity. 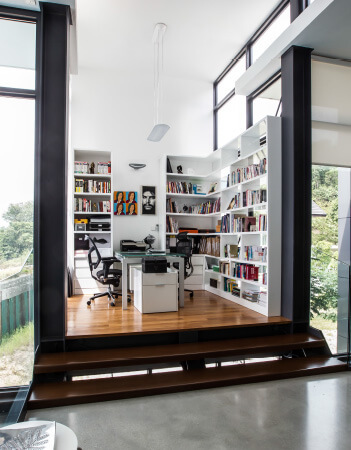 Apart from the tranquil or stimulating atmosphere dictated by your preferences, a home office is an exercise in flexibility. Work as, when and how you please. If your schedule for the day is not too demanding, a leisurely breakfast might be in order. You may prefer to sort through your email in your pyjamas before beginning the day. Lunch could be spent doing a quick workout or running errands. Repairmen or the gardener could do the necessary while you coordinate the running of work and home. Night owls can sleep the morning away and burn the midnight oil when their brains are at peak productivity. The most appealing incentive, however, is eliminating the daily commute. No longer will you have to rise before the sun does to beat the morning rush or find yourself squashed on public transport during peak hours. According to the World Bank’s 2015 Economic Monitor on Malaysia, commuters wasted between 270 and 500 million hours in Greater Kuala Lumpur traffic in 2014, with lost hours and fuel per person costing at least RM3,100 per year — more than the monthly average salary of RM2,795. An hour or more each way spent travelling to and from the office has real physical, psychological and economic impact and to many people, the cost outweighs the benefits. Of course, working from home isn’t entirely a blissful fantasy, with overlapping responsibilities to juggle and temptations aplenty. Clever coordination is sometimes required, but with discipline, focus and the joy of working from a sanctuary of your own creation, going to the office can be a pleasure.